Yesterday was one of those mostly quiet and pretty slow-moving days, so I had a chance to look over some books and websites for games and things to do. One idea I read about was playing “War” with two cards instead of one, using the sum of both cards to win the cards of the other player. In the classic game, you deal all the cards between the players and then you flip the top card over. The person with the highest number gets the cards – face cards being worth ‘10′. You go through the stack until either one person holds the entire deck, (using and shuffling captured cards when you run out), or players are ready to quit. The player with the most cards wins. I showed it to Trevelyn. As we played this addition version, it occurred to me that we could we easily turn this around, and play a “subtraction” version. The object would be to lose the most cards, to get the lowest possible score. So it turning over two cards -say an 8 and a 2 – the score would be “6″. 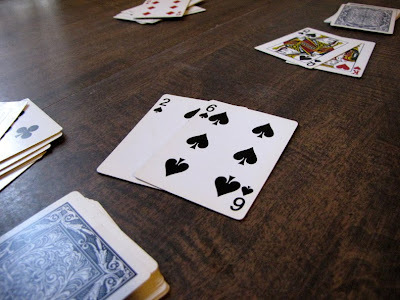 Two face cards (10 – 10) would be “0″, leaving all cards going to the player who was left with 6. The first person out of cards (or with a smaller stack) wins!